Many dogs love to play tug of war; it's a healthy display of their predatory nature. 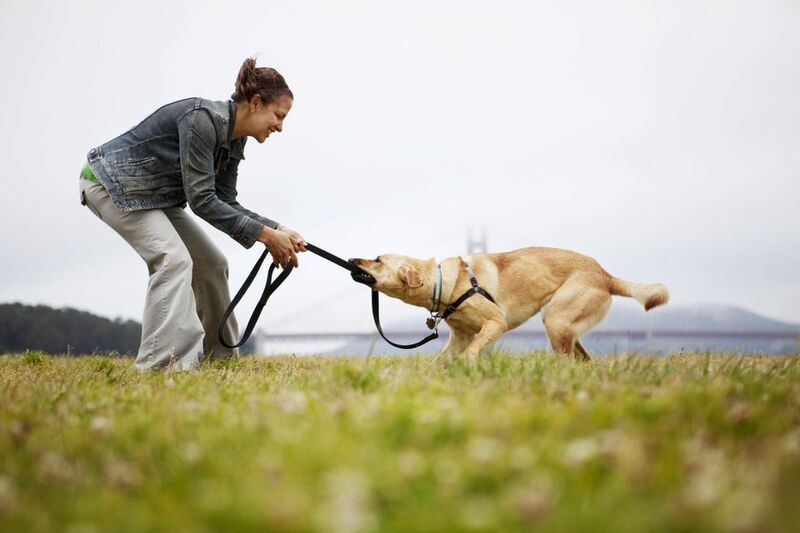 Tug of war provides great mental and physical exercise for your dog. It is also a wonderful way to reinforce the human-canine bond. But if you're going to play safely, you have to make sure you and your dog know the rules and parameters before you start playing. These rules keep the game from going overboard. As long as your dog is properly trained, you should have no qualms about playing this game together. Before you begin playing tug of war with your dog, establish a command to end the game, such as drop it. This will help you stop the game when necessary. You should be able to rely on the fact that your dog will drop the toy if things get out of hand. Make sure your dog has mastered your release command before you begin playing tug of war. Pick a dog toy that is designed for tugging, and that you won't use for other games such as fetch. The toy should be durable and flexible. The best tug toys are typically made out of rubber or similar material and have a comfortable handle that keeps your hand away from the dog's mouth. Good choices include the Kong Tug and the Orbee-Tuff Tug. Play in a large area without distractions, clutter, or dangerous objects. Outdoors is great, but the beauty of tug of war is that it can be safely played indoors if you have a bit of space. Make sure there is room for you both to move about and that there is nothing in the way should one of you back up. You should always start any games of tug of war to set the tone. You make the rules, and you should be the one to decide when you and your dog play tug of war. While playing tug of war, your dog might get excited and begin growling. This is normal, as the game itself is predatory behavior. However, it is important to keep your dog from becoming overly excited or aggressive, and take breaks to keep the game from getting out of control. A bit of growling with the tail still wagging is probably OK, but anything too intense warrants a break. In fact, if you are feeling uneasy or in doubt at any point, take a break. If your dog's teeth come into contact with you at any point, play should stop immediately. Let out a yelp, say your release command, and then take the toy and walk away for at least 30 seconds. It's OK to let your dog win while playing tug of war. In fact, it's a great idea. Winning builds its confidence and rewards the animal. However, if the dog misbehaves during the game, you should be the one who ends up with the toy. Two dogs can play tug of war with one another as long as they get along on a normal basis. The game should be supervised, and the same rules apply. Take breaks if they don't follow rules, as this will help keep it from getting out of control. To take a break, stop tugging and use the release command. Take 30 seconds or so to go through basic commands like sit and down. Once your dog seems more relaxed, the game may resume. To ensure that your dog will always drop the tug toy without hesitation, practice the command frequently during the game. This is akin to proofing other tricks and behaviors you teach your dog, to make sure the training sticks. If your dog bites two or three times, even if it's accidental, the game of tug of war should be ended for the day. This is to remind your dog to be extra careful with its teeth. It is likely that teeth might graze you from time to time due to the nature of the game, but once your dog understands the rules, it will be much more careful. Playing tug of war with your dog can be a quite rewarding experience. Games are mentally and physically stimulating for your dog, and pretty good exercise for you, too.